Formaldehyde is a chemical which, when mixed with water and turned into a paste, is used for embalming dead bodies and preventing the decay of dead cells. When a human body is given to a professional funeral parlour, for instance, the blood is taken out and formaldehyde is injected so that the deceased looks normal before being buried. People who hunt, or have pets, often have the dead bodies of the animal “stuffed” by taxidermists and kept in their houses. Labs and teaching institutions do the same with cadavers. It is used in commerce as formalin. Formalin is a saturated solution of formaldehyde gas in water. It contains 37 per cent – 40 per cent formaldehyde gas with a stabilizer. The most common stabilizer is 10-12 per cent methanol. Methanol is also toxic for humans. As it is a strong disinfectant and tissue hardener, it is used for preserving biological and anatomical specimens. It is also used as an antiseptic in sterilising surgical instruments. Can formaldehyde/ formalin cause cancer? As far back as 1980, laboratory studies showed that even sniffing formaldehyde could cause nasal cancer in rats. In 1987, the U.S. Environmental Protection Agency (EPA) classified formaldehyde as a probable human carcinogen. Now the International Agency for Research on Cancer (IARC) has classified formaldehyde as a human carcinogen. Since the 1980s, the National Cancer Institute (NCI), a component of the National Institutes of Health (NIH), has conducted studies to determine whether there is an association between exposure to formaldehyde and an increase in the risk of cancer. The long-term effects of formaldehyde exposure have been evaluated in epidemiologic studies (studies that attempt to uncover the patterns and causes of disease in groups of people). NCI surveys of professionals who are exposed to formaldehyde in their work, such as anatomists, embalmers and funeral industry workers, have seen that these individuals are at an increased risk of leukaemia and brain cancer compared with the general population. The study, which looked at funeral industry workers who had died between 1960 and 1986, showed that those who had performed the most embalming, and those with the highest estimated formaldehyde exposure, had the greatest risk of myeloid leukaemia. An additional 10 years of data on the same workers were used in a follow-up study published in 2009. This analysis showed a possible link between formaldehyde exposure and cancers of the blood and lymphatic systems. Earlier analysis of the NCI study found increased lung cancer deaths among industrial workers compared with the general U.S. population. A study of 11,039 textile workers, performed by the National Institute for Occupational Safety and Health (NIOSH), also found an association between the duration of exposure to formaldehyde and leukaemia deaths. Several studies have found an association between formaldehyde exposure and nasopharyngeal cancer. The inhalation of formaldehyde gas in even small quantities is followed by bronchitis and pneumonia. Pneumonia is due to the inhalation of the gas and not to secondary infection. Pneumonia and bronchitis are found in all animals after an injection of formalin. Formalin belongs to that rare group of poisons which is capable of producing death suddenly when swallowed. The introduction of formalin into the stomach is followed by the production of gastritis which varies greatly in character. The duodenum and small intestine may also get inflamed. Even a very dilute ( 1-1000 parts) injection of formalin causes inflammation of the stomach lining . Once in the abdomen, formalin exercises a destructive action upon all organs (pancreas, liver, peritoneal fat, fallopian tubes, etc.) with which it comes in contact and causes inflammation in these organs. The injection of formalin into the muscles produces myositis or inflammation of the muscles. When formalin is dropped into the conjunctival sac a painful inflammation of the iris follows and may be severe enough to destroy the eye. Formalin, in whatever way introduced into the body, is absorbed and capable of producing lesions in the respiratory organs. Changes in the liver after absorption of formalin consist of mild or severe cloudy swelling. Necrosis may result. The injection of formalin, or the inhalation of formaldehyde, produces cloudy swelling of the kidneys. Necrosis may result. Animals subjected to chronic poisoning with formalin develop fibrinous peritonitis, associated with marked eosinophilia. Peritonitis is the inflammation of the peritoneum, the lining of the inner wall of the abdomen and cover of the abdominal organs. Symptoms may include severe pain, swelling of the abdomen, fever, or weight loss. Why am I telling you this? Because in June 2018 authorities found 9,600 kg of fish, preserved in formalin, being exported to the rest of India at the border check post of Arayankavu in Kollam district. Raids followed. 6,000 kg of fish were found laced with formalin in 8 trucks in Palakkad. 14,000 kg of formalin prawns were found entering Kerala from Andhra Pradesh. Instead of burning them, officials returned the trucks to A.P. and they were probably rerouted by the factory owners to another state. The state food safety department officials intercepted a cargo of chemical-laced fish from Tuticorin in neighbouring Tamil Nadu. The fish that arrived in two vehicles included 7,000 kg of prawns and 2,600 kg of other species. The citizens of Kerala eat 2,500 tonnes of fish every day and 60 per cent of that comes from local sources and the rest from other states. The Central Institute of Fisheries Technology (CIFT) in Kochi has found 63.9 milligrams of formalin in every kilo of fish and 4.1 milligrams in every kg of shrimp. The office of the Food Safety Commissioner has its hands full. Thousands of kilos of formalin fish and seafood are coming in and out of Kerala every day. They have issued a health warning that says fish vendors have been found to be selling fish products, including crustaceans, treated with formalin. 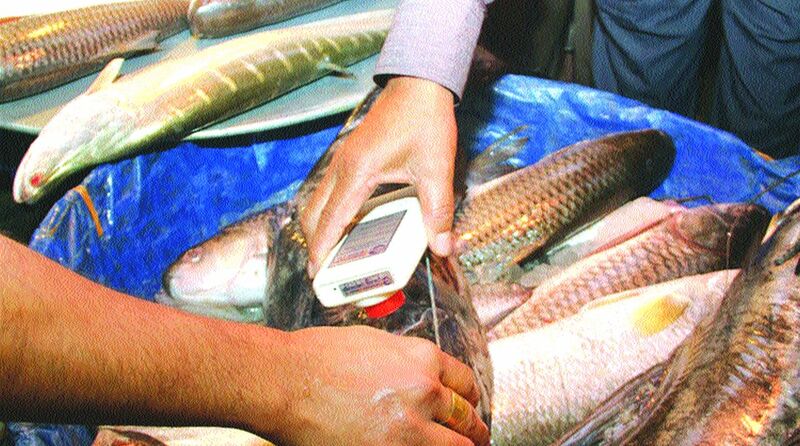 In the last month 28,000 kg of adulterated fish have been destroyed. Is this a new practice? No. Formalin has been used for many years now to give the appearance of freshness to weeks old fish. First it used to be used when fish moved interstate. Now it is used on all fish which move a mile. Why are the authorities cracking down on it now? Because, while they have been aware of it for years, only now has the CIFT developed a kit to detect ammonia and formalin! Does this happen only in Kerala? The fisheries department in Punjab sounded an alert 15 years ago saying that all fish coming from Delhi was contaminated and specifically naming the Pangasius or Basa catfish. The then health minister of Delhi, Dr A.K. Walia, said he was unaware of it and did not take any action at all. Every day about 30-50 tonnes of fish arrive at Ghazipur Fish market from Orissa, Gujarat and Andhra Pradesh. No checks have yet been done. But whenever a truck has been checked in other states the Basa fish, farmed and exported from A.P., has been found adulterated. It takes a week for the trucks from A.P to reach North India. Between September and March, Punjab consumes nearly 250 tonnes of Basa fish every day, mainly eaten by very poor farm labourers from other states. As far North East as Nagaland the practice is so prevalent that a notification had to be issued this year prohibiting the sale of formalin-laced fresh fish products. So far the Kohima district administration has seized four vehicles. Nagaland Food Safety Commissioner has prohibited the storage, distribution, and sale of fresh fish products treated with formalin or ammonia, with a fine of Rs 10 lakh for any violations. This includes crabs, lobsters and prawns. Assam has put a ban on all fish entering it, after they found formalin in all the fish. Odisha has issued an order to collect fish samples from all markets after they found formalin from the Unit IV fish market on July 13th. Maharashtra is bringing in laws to regulate the fishing industry which will now make it mandatory for all fish sellers to get licences, and which lays down norms on prohibited preservatives. There is currently no law about sale/ purchase/ transport/ storage/ use of preservatives and where fish should be dried. Fish sale has increased by 5.6 per cent in the last year alone. You will find that the sale of formalin has increased by ten times that amount, which means similar increase in abdominal pain, vomiting, unconsciousness and cancer. If you want to test the fish you buy, get a kit from the CIFT. Remove the strip and rub it on the fish. If it turns blue, you are eating formalin.